Much like their Mancunian rivals, Manchester City have seen many highs during their colorful existence. With four First Division/Premier League titles, five FA Cups, three League Cups and one Cup Winners' Cup, City stand tall as one of the most successful English football clubs of all time. Still, their history contains more than enough lows to even it up; for example, City are still the only English champions to be relegated the very next season. The club was formed in 1880, under the name of St. Mark's, after an initiative by Arthur Connell (the rector of St Mark's Church) and his daughter, Anna Connell. After calling them self Gorton FC and Ardwick AFC for shorter periods, they would change their name to Manchester City in 1894. This coincides with some financial troubles that eventually led to restructuring of the club. The name change – combined with moving to the spacious grounds of Hyde Road a couple of years later – saw Manchester City become the most popular club in the city, with an enthusiastic fan base that followed them wherever they went. This rise in stature led to the club earning promotion to the First Division in 1899. Shortly after City had claimed their first trophy in 1904 (FA Cup), seventeen of their players were suspended due to allegations of financial misconduct; this led to the club's star player, Billy Meredith, moving across town to United, where he later won two league titles. In 1923, the club moved to Maine Road due to a fire that had destroyed the main stand at Hyde Road. In 1934, City returned to the path of success by winning their second FA Cup. Along the way, the club broke a record for highest attendance in a single game – which stands to this day – with 84,569 home fans gathering at Maine Road for a sixth round match against Stoke City. Three years later, City took home a First Division trophy in style, by scoring over 100 goals during the course of the season. This was followed by a long period of decline. With only a single FA Cup in the next three decades and attendance slowly dwindling, it was high time for changes. After Joe Mercer was appointed as manager in 1965, the club entered a hot streak; during his six years in charge, City won a First Division title, both English Cups and a Cup Winners' Cup. The post-Mercer period saw the club win another League Cup in 1976 before succumbing to another long spell of mediocrity. The return to top football in England started in the season 1998-99. After a dramatic play-off match against Gillingham, City succeeded to climb from Second Division to the First Division. The team managed to go directly through the Division One to the Premier. After relegation from Premier League, they would the next season win First Division by ten points ahead of West Bromwich. And after that, Manchester City has established them self as a Premier League team. For many years, Maine Road was City's home stadium, but in 2003 City of Manchester Stadium was built with a much bigger capacity. A takeover by the Abu Dhabi billionaire Sheikh Mansour in 2008 signaled a new and triumphant era. Now one of the richest clubs in the world, City immediately started getting busy on the transfer market, acquiring many big-name signings for record fees. The five years following Mansour's take over the club spent over £500 millions on players. The Abu Dhabi influence was also displayed by the decision to change the name of the home stadium to Etihad Stadium in 2011. 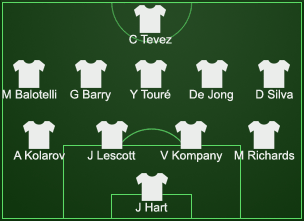 Man City line up 2011 FA Cup final v. Stoke (1-0). This shopping spree saw the club relive their glory years, winning Premier League, one FA Cup and League Cup titles in the period that followed. A high point was the league victory in 2017-2018 season in which City became the first team ever in Premier League to collect 100 points in one season. Manchester City has made use of three dissimilar logos. The first version was abandon in 1960, but used again a shorter period. The second design, introduced in the 1960s, would return as the logo in 2016 replacing the logo with the eagle behind the shield, which had been used since 1997. The current logo has a ship (symbolizing the historical trade function of the city) in the upper part of the shield and the Red Rose of Lancaster (symbolizing the historic connection with Lancashire) in the lower part of the shield. 1880 The club is established (named as St. Mark's). 1887 The club is renamed to Ardwick AFC. 1887 The club move to the Hyde Park stadium. 1892 Division 2 is established with Ardwick AFC as a founding member. 1893 The Canadian Walter Bowman become the first foreign player to play for City and also in the Football League. 1896 First FA Cup participation. 1899 The team is promoted to Division 1 for the first time. 1894 The club is renamed to Manchester City. 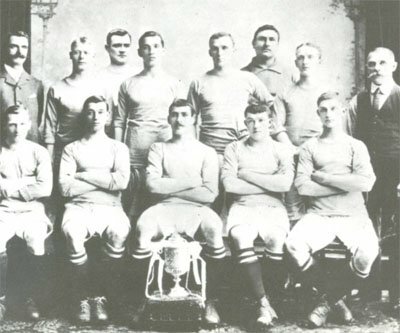 1904 Winning their first tournament trophy (FA Cup). 1923 MCFC move to the Main Road stadium. 1937 First time Division 1 champions. 1965 A new logo is adopted. 1970 Winning their first European competition (Cup Winners' Cup). 1979 Steve Daley become the first player transferred to the club for a fee over £1 million (£1,450,277). 1997 A new logo is adopted. 2008 The Abu Dhabi United Group become the new owner of the club. 2015 Kevin De Bruyne become the first player transferred to the club for a fee over £50 million (£55M). 2014 Winning their first British Double (the League and the League Cup).